Using an heirloom engagement ring is a wonderful way to add even more meaning to a special time in your life and honor a loved one at the same time. However, this type of ring also comes with some high expectations and heightened emotions, as well as some delicate etiquette considerations. It's important to remember that etiquette rules aren't there to preserve tradition or control behavior; they exist to protect people's feelings. This ring doesn't just involve the feelings of you and your fiancé. It may also carry the emotions of many members of your family. Use these guidelines to make sure everyone has good feelings about your use of this special ring. It's natural to assume you are entitled to use the heirloom ring that exists in your family, especially if you've been promised that honor. However, you may not be the only person who feels this way, and misunderstandings can occur. Ask the ring's previous owner if she will be supportive of you using it. If the previous owner is deceased, discuss your plans with other members of the family and check the will carefully to ensure other potential heirs are not the rightful owner of the ring. Listen carefully to any objections or concerns member of your family may have. Open communication is essential. If you have a relative who still wears the ring, she may not be ready to give it up as soon as you ask. It's her ring, after all, and it has special meaning for her. Plan ahead by asking for the ring several months before you plan to use it. Give the ring's previous owner time to decide whether she will part with it, and don't put a lot of pressure on her. 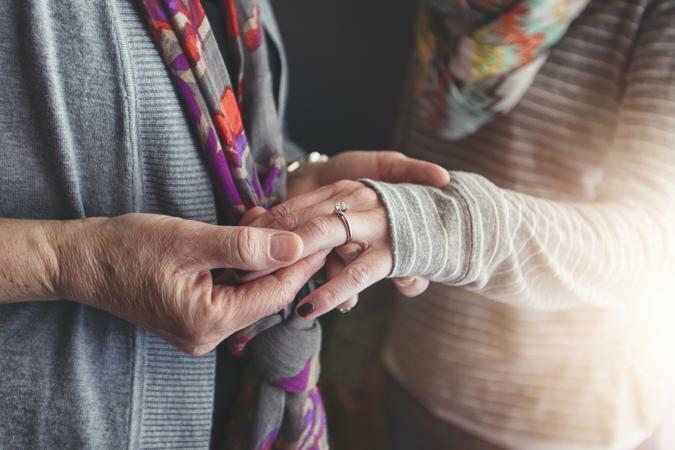 If the previous owner is deceased and didn't leave clear instructions about the ring in a will, it may take some time for the family to come to an agreement about the use of the ring. An heirloom ring is much more than a lovely piece of jewelry. Part of this ring's appeal is in its rich and meaningful history. Take some time to sit down with the previous owner and really listen to what she has to say. Ask how the ring was presented to her. Talk about the ring's history before that. If the previous owner is no longer living, talk to other family members about the ring's history and their memories of it. Take notes and consider having them printed up for yourself and the ring's previous owner or other people in your family. This ring is an important part of your family history. Recognizing and recording its significance shows that you take it seriously. Whether you are using a ring that previously belonged to a living relative or a family heirloom that has been waiting in a safe deposit box for years, it's essential that you show your appreciation for the honor of using it. There are lots of ways to do this, including a heartfelt thank-you note, a few lines in your wedding program, or a special gift. You may even want to consider having the previous owner be present when you propose, or proposing in a spot that was special to the person who wore the ring before. Wearing an heirloom engagement ring is a huge honor, but this piece of jewelry also has to reflect the wearer's personal style. If the recipient loves all things modern and the ring is an elaborately detailed antique, she may not want to wear it. Discuss this issue before presenting the ring, since she may feel very awkward telling you about her feelings later. Also consider the possibility of modifying the ring to suit the recipient's personal preferences. Changing the setting or gems of a ring is always a delicate business, but it's even more complicated when the ring is an heirloom. If you are thinking about modifying the ring's setting or style, you should always get permission from the previous owner if she's still alive. Be prepared for her to refuse, and make sure to honor her wishes. If the past wearer of the ring is no longer living, other family members may still have strong feelings about this issue. Listen carefully to what they have to say and take their feelings into consideration. Even if you use the ring with the exact setting and gems it has now, you'll need to have it resized to fit the finger of the new recipient. If she receives a ring that's way too big or too small, she may not really feel like it is hers. Additionally, professional cleaning is important to make the ring look its best before the big moment; you don't want to present a dirty engagement ring. If the ring is clean and perfectly fits her finger, she'll be able to truly appreciate its beauty and importance. In the unfortunate event that the engagement is broken off, it's customary for the recipient of an heirloom ring to return it. This ring is a family heirloom, and it belongs with the family. From there, the ring may or may not be returned to its previous owner if she's still living. Communication is essential in this type of situation. If you keep everyone's feelings in mind and anticipate potential issues before they happen, using an heirloom engagement ring will be the meaningful and lovely gesture it's supposed to be. Ultimately, this type of ring is about honoring family and love. The best way to do that is by remembering to use proper etiquette.